It’s not easy for a driver to accomplish one million safe miles, let alone three million. However. Over-the-road driver Jesus Ortega has beat those odds. 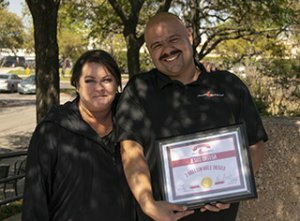 Jesus attended CDL training at Stevens Driving Academy in 1994, then transitioned into a trainer role, and stayed as a company driver ever since, driving all around the great United States. When Jesus first came to Stevens, he only had intentions to stay until he had enough money for college. But after having some amazing experiences driving, Jesus decided to make a career out of trucking. Other coworkers described Jesus as dedicated, on the go, and a family man. Speaking of his family, when Jesus isn’t delivering his loads, he loves spending time with his wife, 24-year-old son and 14-year-old daughter. When asked about his favorite part of the job, Jesus said that “you get to take time off anywhere you want”. Because of this, Jesus has been able to take his family on the road with him and explore his favorite places, which include New York City and Washington, D.C. When asked if any of his family was planning on following in his footsteps, Jesus said no, but that “he works hard so they don’t have to”. Congratulations to Jesus! All of us at Stevens Transport wish safe travels! By clicking 'continue', I consent to receive telephone calls and text messages from Stevens Transport containing information at the number above about their programs. I understand that the calls and messages may be initiated with automated equipment and that I am not required to provide this consent to be eligible to apply.